As a working outdoor journalist exposed to the opinions of many on the subject, this has become the de facto big question subtext of almost every assignment. The thought first plagued me a few years back while navigating the headwaters of the Yukon’s Snake River, a 300-km watercourse widely considered pristine—no roads, no residents, no development. By the standards of those who purport to want to protect watersheds—governments, industry, NGOs, individuals—this was wilderness personified; yet everyone from whitewater canoeists to hunting outfitters to mining interests thought they could have a piece of it without altering its fundamental nature. “Wilderness” suddenly had a lot of stakeholders. The definition I’d been mulling, I realized, was a matter of degree: not this, but that; some, but not all; us but not them. As many variants as special interests concerned with it. A bigger problem was that all of these constructs were ours—relative and contextual. Perhaps real wilderness defined itself by functionality: the natural intertwining of landforms and waterways; the presence of indigenous, co-evolved plant and animal life; intact ecosystems operating the way they have since they arose. There’s different roles for humanity in all of this—a departure point that may demarcate the difference between our “over there” concept of wilderness and the participatory wilderness of First Nations. I had once had occasion to ask Guujaaw, a renowned artist and then-president of the Haida Council, about the relationship between the cultural depth of his people and the natural/biological depth of Haida Gwaii. “Our rich culture reflects the richness of both the land and marine wilderness,” he’d replied so easily that I’d felt silly for posing it. It’s hard to argue that a sustainable existence that doesn’t outright destroy an ecosystem could preserve something akin to wilderness, but there are other, more facile ideas on this, as I’d learned while investigating the widespread and continuing belief in monsters like Lake Okanagan’s celebrated Ogopogo. Which begs, in no uncertain terms, the question of what is worse for humanity, the failure of investigation, or the failure of imagination? 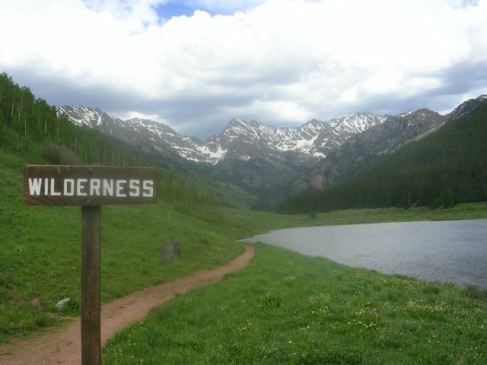 In the end we’re back to the beginning: what is wilderness? Is it no human footprint or very little? Does long use and transient habitation by First Nations qualify or disqualify? Without consensus, do we simply look to nature for answers about how and what to protect to preserve what we think we should? Or do we require a new definition in this age of reclamation, one in which something like the historically (and currently) logged territory of Algonquin Provincial Park is the largest preserved “wilderness” in Ontario. And what of piecemeal protection, such as allowing a land-scarring mine that may benefit society—but only as long as the resource or changing economics of demand last. Ultimately, the question of wilderness isn’t new to me, but one I’ve confronted from nature-addled kid through all of my professional life. One consideration might light a way to understanding: whatever we may choose to call wilderness for purposes of short-term relating or pacification, we inherently know that true wilderness, the type that the Earth doesn’t make anymore, offers the wealth of connection in perpetuity.